Report from the Ashram - With the beginning of April, the city and surrounding area has started experiencing a burning summer. The temperature in general started swinging between 32 degrees Celsius to 40 degrees Celsius, but at nights garden lawns of Sivananda Udyana (garden) is crowded with the friends and families to feel cool breeze and to soothe the mind amidst the ringing bells, blowing conch and temple orchestra of Sri Vishwanath Temple and Sri Sri Sri Ashta Lakshmi Bhavan. 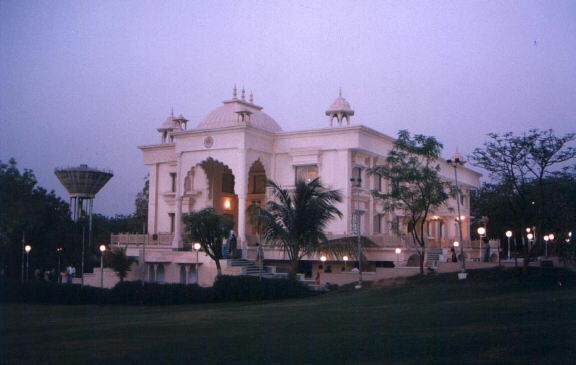 Yoga activities of the Ashram are the biggest attraction to the people of Ahmedabad. Since early dawn, meditators, devotees of the Lord, and yoga enthusiasts flock in the Ashram Premises. About three hundred enthusiasts including engineers, doctors and scientists attend yoga lessons from 5:30 AM to 6:45 AM and from 7:00 AM to 8:00 AM. Ashram’s administration is highly thankful to Sri Suryakantbhai, Sri Nitinbhai and Miss Sangita Thawani Ji for their very sincere, committed, and dedicated service to the mankind. Yogasan class for the women from 4:00 PM to 5:00 PM is also blooming under the kind direction of Mrs. Yojna Tanden and Mrs. Janki. Evening Yoga & Meditation Class conducted by Ms. Sangita Thawani has always been in demand. Ashram conducted three Reiki Teachings (Level I & Level II) in month of April guided by most respected and blessed Mrs. Rupa Majmudar and assisted by Mr.Tapan Mankodi. Holy Sri Gurupaduka Pujan on every Thursday from 8:30 AM to 9:15 AM is being performed by Dr. M.J Patani Saheb (Acting President) and Sri Marutbhai Dave (Vice President ) of the Ashram. A large number of devotees join for this sacred ceremony. Satsang on every Sunday morning from 9:00 AM to 10:00 AM led by respected Dr. Patani Saheb and daily satsang of the Ashram from 9:00 PM to 9:45 PM led by H.H. Sri Swami Guru Sevananda Ji Maharaj are attended regularly by many devotees of the Ashram. Holy Sri Ram Navami celebration - Holy Birthday of Lord Sri Rama (Sri Ram Navami) was celebrated on Friday April 11th, 2003. Holy Sri Ram Charit Manas was read from 9.00 AM to 12.00 PM and it was followed by devotional music in praise of Lord Sri Rama. Sri Hanuman Jayanti - a very special worship was conducted at the Ashram’s Sant-Niwas prayer hall on Wednesday April 17th; holy birthday of Lord Sri Hanumana was celebrated with great enthusiasm with a special prayer for peace and harmony amongst the mankind. A Yajna with the holy chants in the praise of Lord Hanumana and singing of Sri Hanuman Chalisa filled the entire atmosphere with great inner satisfaction and joy. Sri Jitukaka Patel (Green Man) and Sri Shambhu Singh ji were the main organizers of this program. Third Holy Anniversary of Sri Sri Sri Ashta Lakshmi Bhavan - was celebrated in traditional way. 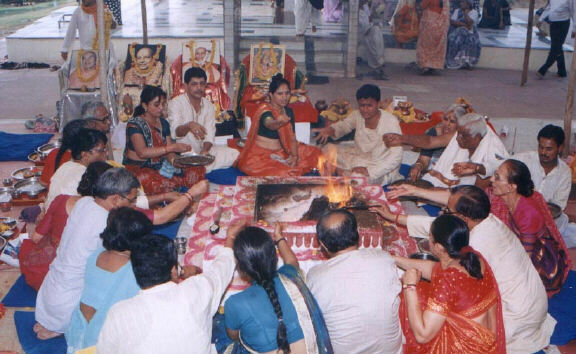 All the principle donors of the various deities join for the morning worship and grand Nava Chandi Yajna was organized from forenoon to late evening, which followed with a community feeding (Maha Prasad). Actually April 29th is the foundation day of Bhavan, but for the convenience of the devotees, it was organized on Sunday April 27th, 2003 on holy Varuthini Ekadasi. Regular worship services of the temple are attended by devotees from far and wide places very regularly. Ashram management and trustees are highly thankful for the dedicated, committed and faithful services of respected Sri Ram Krishna Sonar Saheb (secretary), Sri Harkantbhai Vachharajani (treasurer) and many selfless supporters who look after day-to-day management of the ashram. Once again nature gave a warm welcome to worshipful Swamiji Maharaj with snow-laden carpets & beautiful hanging icicles from the trees. Pujya Swamiji Maharaj conducted Yoga Classes in the morning and gave spiritual discourses in the evening at Markham’s Hindu Cultural Center. March 30th , being Sunday, the cultural center was crowded with young and old ones to give warm welcome to Rev. Swamiji Maharaj. Prasad (dinner) was served to all who came to attend this wonderful spiritual retreat. Monday 31st March, being a day dedicated to Lord Shiva, Swamiji gave a soul elevating discourse upon the subject of “Lord Shiva and His Worship”. On April 1st, 2nd and 3rd , Sri. Swamiji’s discourses were organized at the well-known “Vishnu Temple” in addition to the regular programs at the Hindu Cultural Center. In spite of a very heavy snowfall, large numbers of devotees attended the satsang of Swamiji upon the subject of “God as Mother” on the occasion of commencement of a holy Vasant Navratri of Hindu New Year. Swamiji was invited to a number of devotees’ homes for Bhiksha and Satsang. On Friday, April 4, in the evening, Swamiji addressed a large gathering of children and their parents upon how to raise family and how to preserve the values of our ancient culture. On Saturday April 5th morning, Yoga, Pranayama & Meditation (two and half hour long) class was attended by many Yoga enthusiasts. A number of American yoga teachers also joined the program and got inspired from the wisdom of the yore. In the evening of April 5, 2003, Swamiji gave discourse upon the “Devi Worship” on the occasion of the spring Navaratri festival. Mr. Bal Krishna Gupta director of religious activities of Hindu Temple of Charlotte organized Pujniya Sri Swamiji’s weeklong program at Charlotte. On Sunday, April 6th,a grand “Cheti Chand Festival” and holy Birthday celebration of Saint Jhulelal was organized with great enthusiasm by Sindhi Community Devotees. Sri Govind Ram Bhojwani Ji led the function. Sri Satya Narayana Bhagavan Katha and worship of Sri Jhulelal was performed traditionally followed by devotional singing and dancing in praise of Jhulelal. Rev. Swamiji addressed a large gathering upon the life and teachings of Jhulelal. Jhulelal was an incarnation of Lord Vishnu, is the firm belief of His devotees. He was a savior. He protected Hindus before partition of India and Pakistan. He had equal number of Hindus and Muslims devotees. It is widely believed that he appeared from the water of river Sindhu so devotees believe that He is a water-God or incarnation of the Lord Varuna. Swamiji’s discourse brought a spotlight upon the humanitarian services and communal harmony made possible because of Sri Jhulelal. From Monday, April 7 to Sunday, April 13, Pujya Swamiji gave a series of discourses on Shankaravedanta based upon his minor work “Atma Shatakam” and “Moha Mudgara”. Shri Pareshbhai & Smt Illa Patel hosted pujya Swamiji and gave loving care. During his stay, Swamiji was invited to a number of devotees’ homes as well as their industrial and business places for His Blessings. Before leaving Charlotte, Swamiji attended Easter services at the Catholic Church. 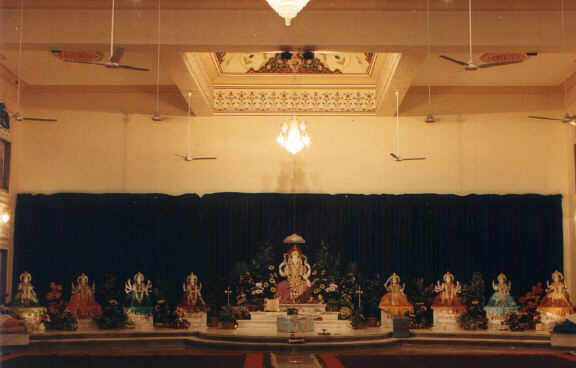 During his stay in Bloomington, Sri Swamiji gave a series of discourses that were organized at Bloomington, Indianapolis, and Hindu Temple of Cincinnati (Ohio). Because of the publicity and announcement in “Indiana Herald Newspaper” a large number of Americans and Yoga lovers took benefit of Sri Swamiji’s Yoga teachings. Because of Rev. Swamiji’s compassion , spontaneous love and interest of sharing the knowledge of ancient science, he taught breathing exercises and yogic exercises to a number of health conscious American morning walkers that he came across during his own morning walk in the public park. While finding a number of people suffering from varieties of breathing problems and allergies, Swamiji took personal interest and guided them for better healthy living. Swamiji was invited to visit several devotees’ homes for Bhiksha and Satsang. Shri Dinesh Patel and Smt Aruna Patel were kind and generous to look after Swamiji’s personal care during his stay at their newly purchased grand mansion. Shri Swamiji was invited for annual cultural program on the occasion of “Holi” organized by Indian Student Association at Indiana University Theater. The program presented by Youth of the University was extraordinary and it was presented with touch of expertise with the purpose of nurturing and preserving culture and values. They brought out the real meaning of cultural heritage of India; that is not the sky scraping temples of south India, towering peaks of Himalayas, not the Geer-lion of Gujarat or not the confluence of Ganga Sagar not the Indian classical music singing and dancing. But the very root of the cultural heritage of India is it’s ancient values of purity, truth, nonviolence and chastity. Praise God, the source of all our gifts! Praise Jesus Christ, whose power uplifts! Praise the Sprit, Holy Spirit! When our hopes lay buried O God, your miracle occurs. Rev. Father Jim Ramsey and Associate Pastor Mr. Gary Houston greeted Rev. Swamiji. Twenty-five years old reverence and sincere regard for worshipful Swamiji was once again revived and cherished by Mrs. Meera Lal and Mr. Anil Lal, a senior executive of General Motors. They organized series of discourses of Worshipful Shri Swamiji Maharaj at Bhartiya temple, Troy, Michigan with kind cooperation of temple management committee. From Monday April 21st to Friday April 25th , Swamiji enlightened the listeners with the inspirational message from the life and teachings of Shri Ganesha, Lord Shiva, Shri Hanumana and Lord Shri Rama. Swamiji also gave a talk on the subject of “Secret of Japa, Yoga and Meditation” to a receptive group of devotees. All the discourses were followed by guided meditation. In the mornings from Tuesday, April 21, to –Saturday, April 26, Swamiji conducted a very systematic and scientific Yoga classes for the general public. Thanks to the publicity in the local daily newspaper of Rochester, Troy, St. Heights and Bloomfield Hills and for their upbeat press notes that attracted a number of Americans to join this wonderful activities catered by Bharatiya Temple. On arrival, Swamiji was given a traditional reception and welcome by the Vedic chanting by high Priest of the Temple. Shri Swamiji was invited to many devotees’ homes for satsang, blessings & special prayer for the sick & suffering members of their family. Swamiji left for Texas on Saturday April 26. On Saturday April 26th, Vimuben and Mr. Kanubhai Patel organized a public satsang at Houston Texas. On Sunday April 27, worshipful Swamiji inaugurated Motel and franchise owned by Mr Dinesh Patel at Austin Texas. Holy Sri Chandi path (Shri Durga Saptasati) was organized and Pujya Swamiji graced the occasion. From Sunday 27th to Friday May 2nd a series of discourses were organized to enlighten the listeners on the subject of “Significance of Devi (God as Mother) Worship” On Monday April 28th , holy Sri Satyanarayana Vrat katha was organized at new grand mansion of Bhanu Patel (Tiku Patel). Pujya Swamiji was invited to grace and bless the occasion. On Tuesday evening April 29th , Swamiji presided a community function of Shri Laxmi Yantra (Shree Yantra) with a grand Devi worship where a large number of couples joined for this rare spiritual event. Swamiji’s discourses on Devi Mahatmya were most uncommon yet most wanted for the Hindu community of Texas. Shri Swamiji flew to Chicago, IL.